You know how so many of us are asking who or what they are? Answering this question isn’t really easy, but if there’s one aspect about myself that I am absolutely sure about, it’s this: I am an engineer. I like building stuff and I like using mathematics, physics and technology. Whatever hobby or job you have: There are probably associations for your very field. One of these associations for technology believers like myself is IEEE. You can google it, it’s basically a platform for technology-related people and companies. Never heard of IEEE before? Well, chances are you are using IEEE technologies like wifi in this very moment! So I am an IEEE member (as are 400000 others on this planet) and I’ve tried to push IEEE forward in our local university student community and our “local” Austrian IEEE community for the last couple of years. The whole thing got even bigger for me now. Starting 1st of January 2013 I’ve been appointed as the IEEE Region 8 Student Representative, which means my job now is to represent 17000 students from Africa, Europe and the Middle East. Looks like the world has not come to an end on December 21st 2012. With all of the end-of-the-world attitude gone we can not totally focus on 2013! So welcome to all of you who’ve survived New Year’s Eve. 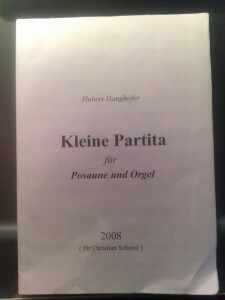 It’s part of a collection of tunes which he calls “Kleine Partita” – Little Suite. While most of the songs are quite sad, I hope that your new year 2013 will be a happy one! I wish you, your family and friends all the best and I hope we’ll meet again to share some happy hours together!